No, while most Westerners associate the country with the world famous spring cherry blossoms, many Asian tourists are equally drawn to Japan’s gorgeous fall colors, which for religious and cultural reasons have become something quite unlike anything else on the planet. There are many phenomenal destinations for fall leaves including well known locations in New England and Eastern Canada. 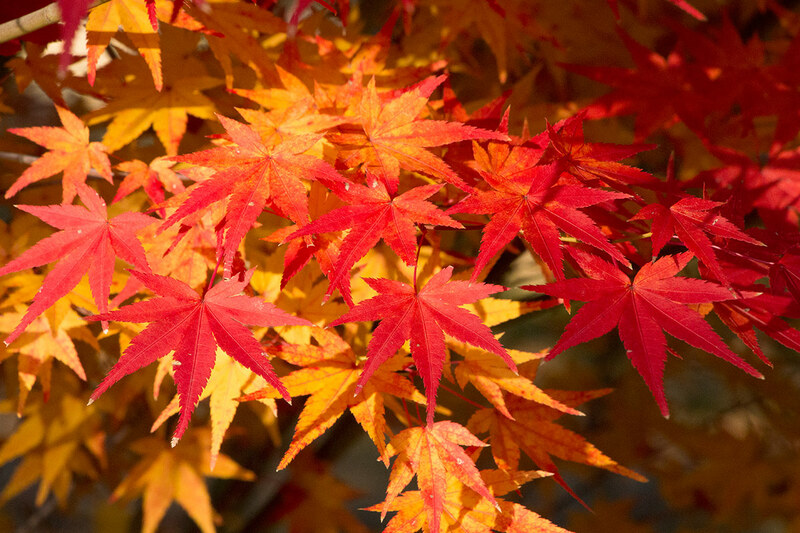 And the shining star of Japan’s fall colors, the Japanese maple, is native to several other countries including Korea, China and Mongolia. So what makes Japan so special? While the natural displays of color in mountains throughout Eastern Asia are all quite impressive, it’s the impact of Japan’s culture and religion on the trees that takes the spectacle to new levels. Japanese have always had a great interest in collecting and cultivating beautiful plants as well as a distinct aesthetic for “artificial natural beauty,” something that seems quite strange to Westerners. For thousands of years, Shinto priests and later Buddhist monks have gathered unique specimens cultivating and grafting them into unique blends that have produced surreal forests around many shrines and temples with colors and leaf shapes that are strikingly diverse. The epicenter of this unique art form is Kyoto. Some trees here boast extraordinary neon hues that shift color with the moving sun. I’m sure you’re thinking that I went nuts with the saturation in the photo of Thomas above, but I have not touched the saturation of a single photo in this entire post! That particular picture was taken at the Eikando Temple at around 4:45 PM. The neon effect in the leaves was really only visible for a matter of minutes before is shifted again into a spicy hot red more like the leaves in the lead picture. Clearly, timing is everything. 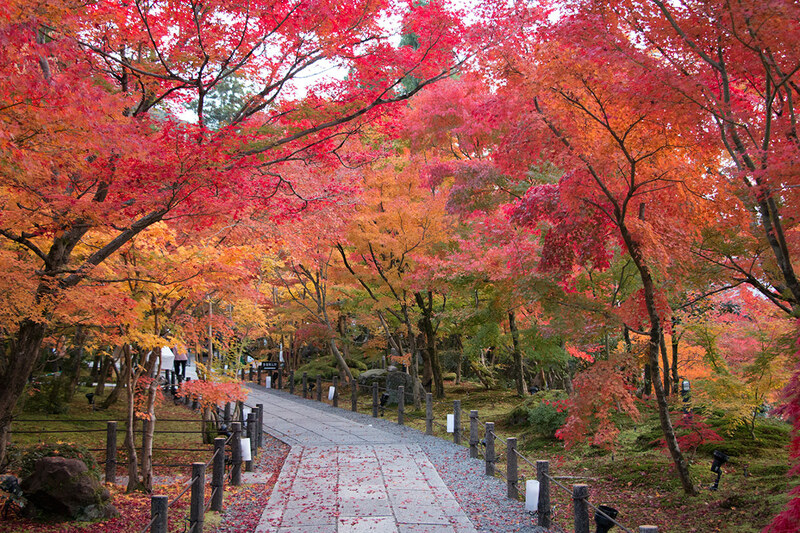 The obvious question is when you should visit Kyoto to experience the fall colors at their peak. Unfortunately, nature doesn’t really work that way. The best time for the Kyoto autumn leaves (紅葉 京都) is generally from early November to early December, but the peak days can vary dramatically from year to year. And climate change seems to be making it even harder to predict those days. To make the situation even more confusing, what represents a peak day? 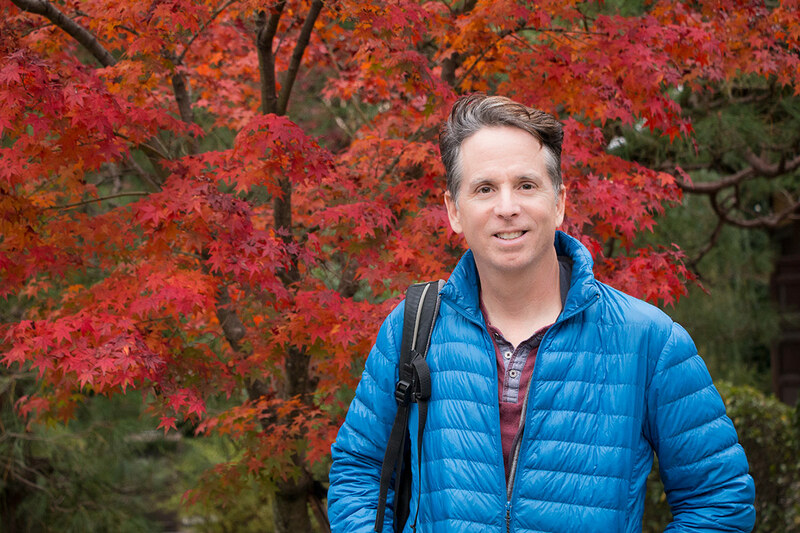 We stayed in Kyoto for a month and witnessed the fall foliage season from beginning to end. It was clear that most tours and Kyoto autumn leaves prediction sites consider the “peak days” the moment in time when the leaves are reddest. 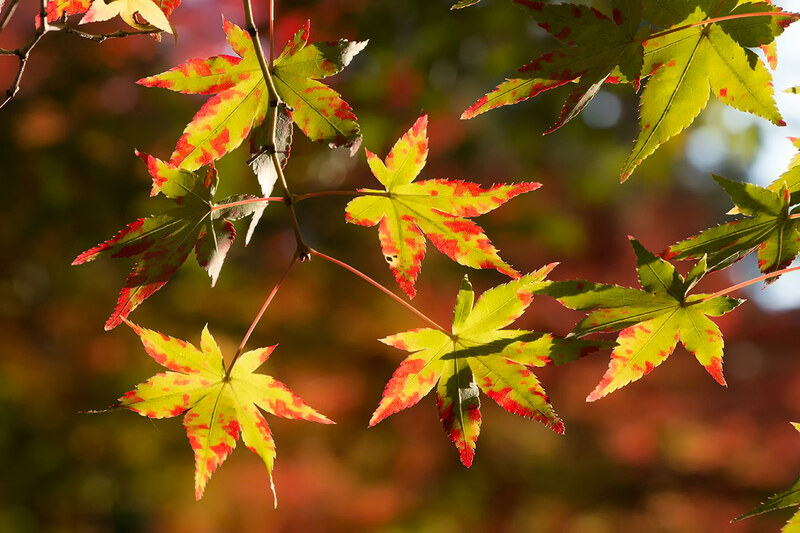 However, we personally considered the peak days the moment in time when the leaves were most multi-colored, which is really in the earlier stages of the change. 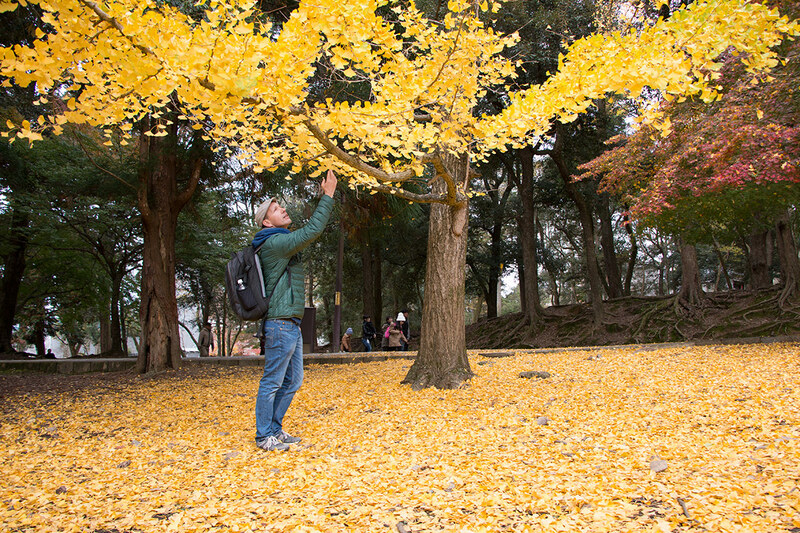 The ginkgo trees also go bright yellow during the earlier period, which is a major bonus. In 2017, the Kyoto fall colors reached their peak about a week earlier than on average. Quite a few of the famous temples peaked from November 21-23. 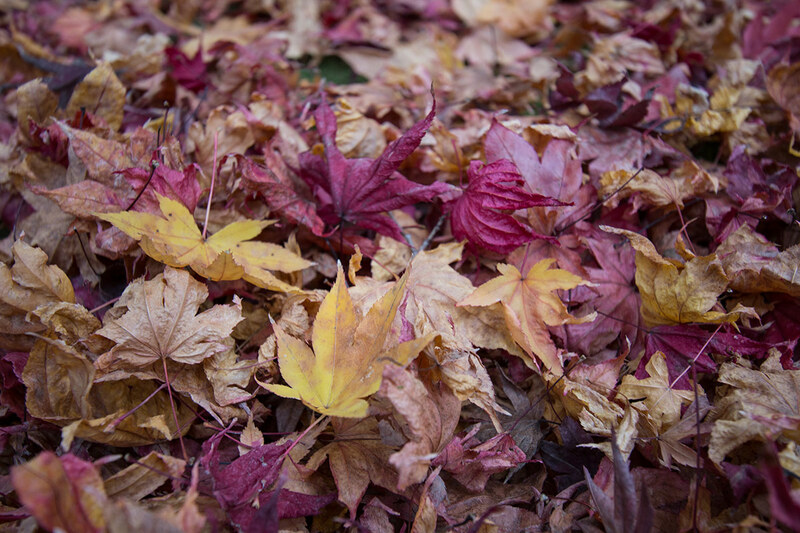 But even a week earlier (November 14), many autumn leaf spots in Kyoto were approaching their peak. In 2016, the color peaked around November 16-18. There was a cold snap on November 19 which seemed to accelerate the change, and peak red seemed to occur around November 20-23. Ironically, the tourist hordes seemed to arrive in the last week of November, which leads me to believe that the peak was a little earlier than expected. From what I’ve read, 2015 was also quite irregular with peak days occurring later than expected. It’s also important to point out that the peak days also depend on which temples and shrines you are visiting, some are better earlier, some later. Which brings us to the second most obvious question. 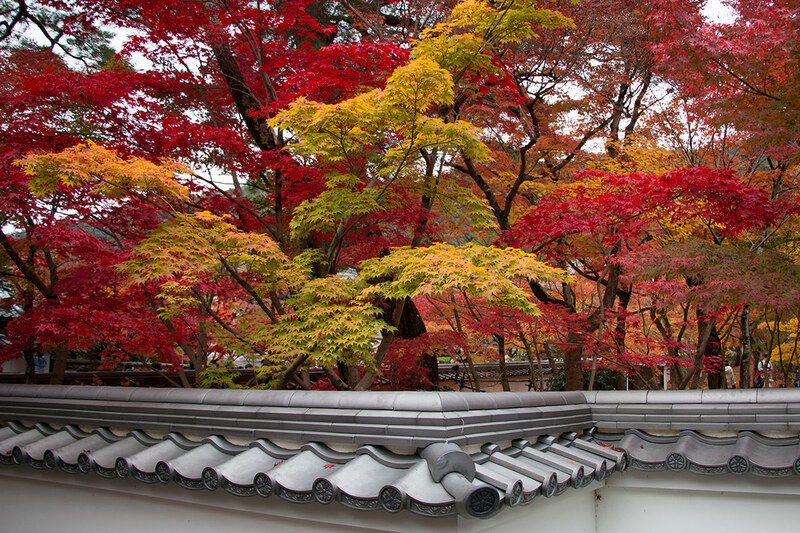 Where are the best places to visit in Kyoto to see the autumn leaves in all their glory? 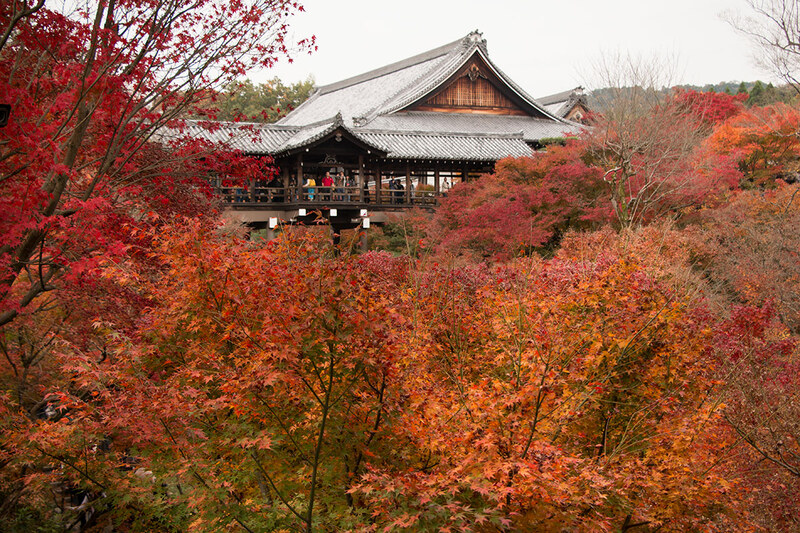 With over 1,600 temples and shrines in Kyoto, the answer is actually easier than you might think: Go to the temples and shrines where the fall colors are peaking when you visit. That might seem like a stupid thing to say, but you would be amazed by the number of visitors and hundred-person tour groups which didn’t seem to get that very basic idea. Ask locals and tourist information offices for advice on what is currently peaking and listen to what they say. 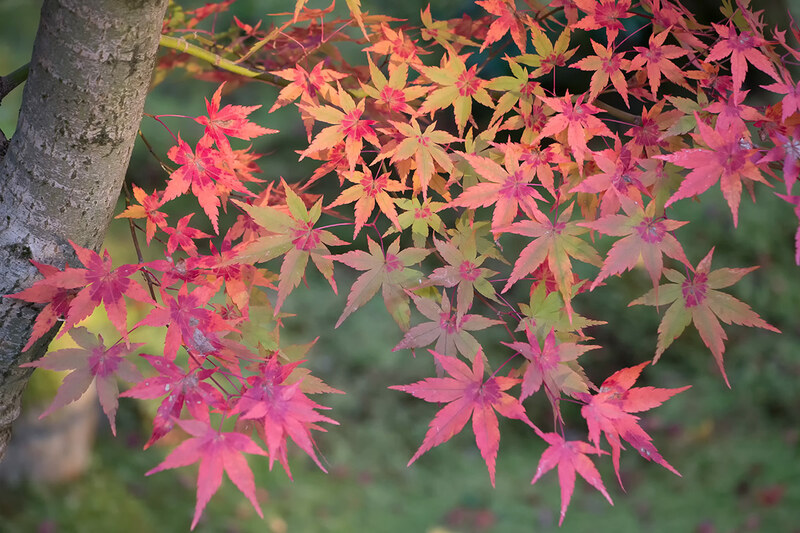 We also highly recommend Japan-Guide.com’s amazing annual autumn leaves reports for detailed timing information for colorful sites during autumn in Japan. Having said that, our favorite overall site was easily Eikando Temple, which boasts a stunningly surreal collection of trees. Almost half the pictures in this post were taken at Eikando. We also really loved the off-the-beaten-track Shinnyodo Temple, a large site which locals seem to be trying to keep to themselves. We also recommend visiting the Togetsukyo Bridge in Arashiyama where you can check out the more “natural” version of the changing autumn leaves in the surrounding hills. 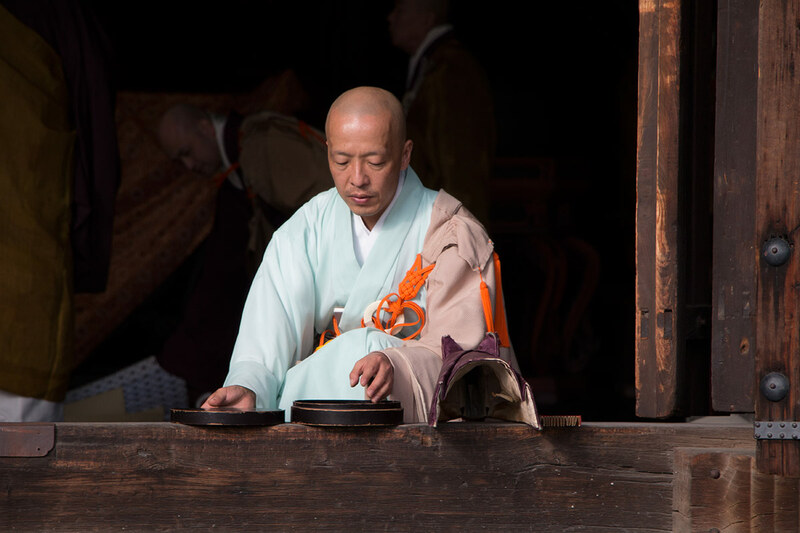 Most importantly, we suggest visitors take a bit of time to explore the backstreets, parks, and off-the-track temples, many of which provide top-notch autumn leaves experiences which rival any of the big-name temples. Speaking of big-name temples, fall foliage fans should be aware that there is A LOT of hype surrounding the Kyoto autumn leaves season. Many online resources single out certain sites for specific photo opportunities: Kiyomizu-dera is known for its balcony shot, Tofuku-ji for its bridges, Daigo-ji for its lakeside pavilion. Similarly, nightly fall foliage illuminations at big-name temples seeking to profit off the Kyoto autumn leaves crowds are really much more about the lights than leaves. If you are a photographer, you will go to these locations. 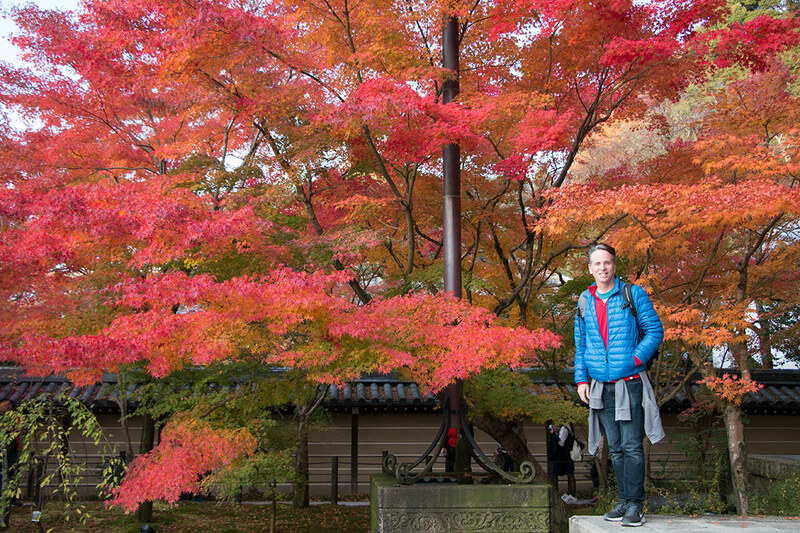 But try not to restrict yourself to these crowded temples, allow yourself to explore some of the less crowded locations to experience the colorful autumn leaves at their best. 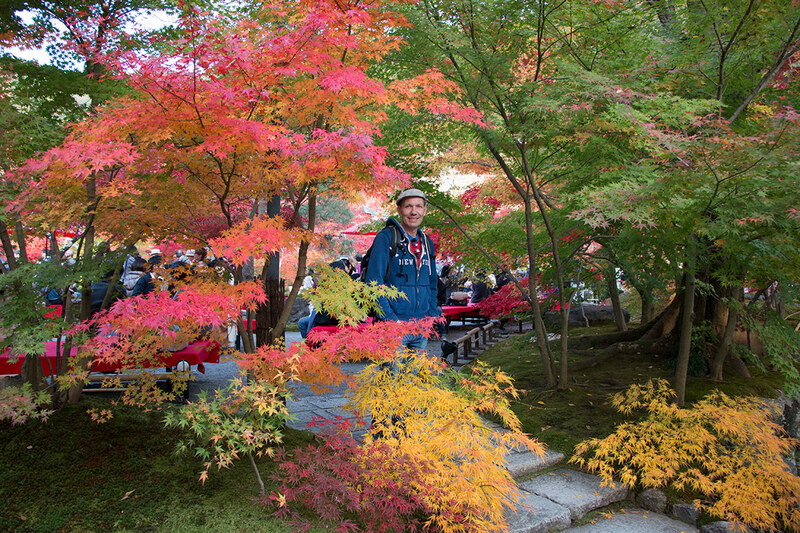 Many of our favorite moments in Kyoto were not at designated fall foliage temples. 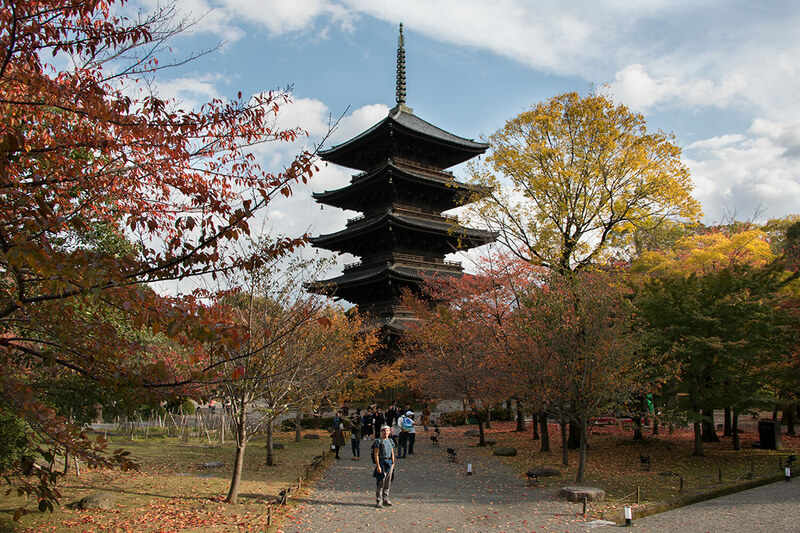 We visited over 50 temples and shrines as well as a large number of parks and gardens during our time in Kyoto and these were some of the highlights we recommend for fall foliage fans. 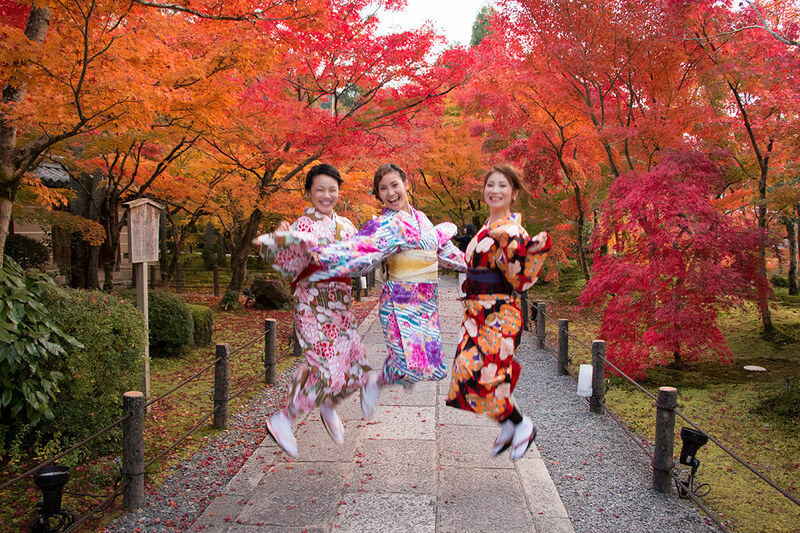 DO NOT assume a high entry fee equates to a better autumn leaves experience, many of our favorite temples and fall foliage locations were free. 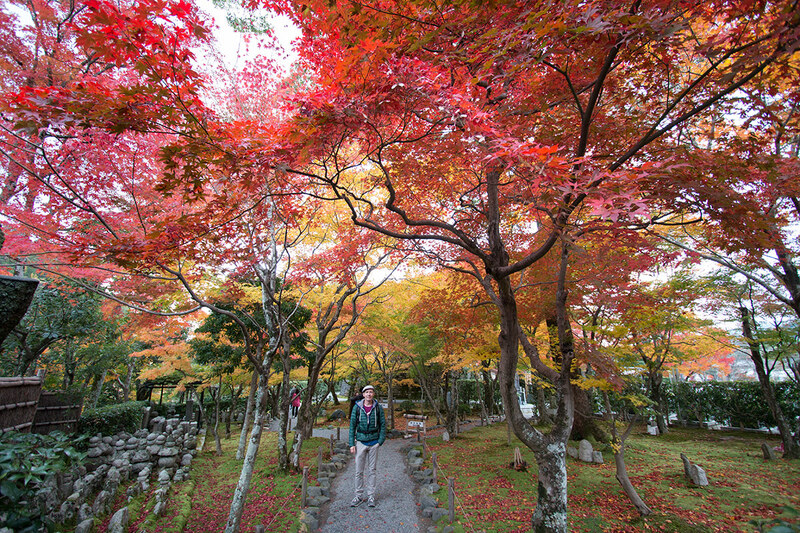 So here are some great walks, parks, and the best temples in Kyoto for autumn leaves. 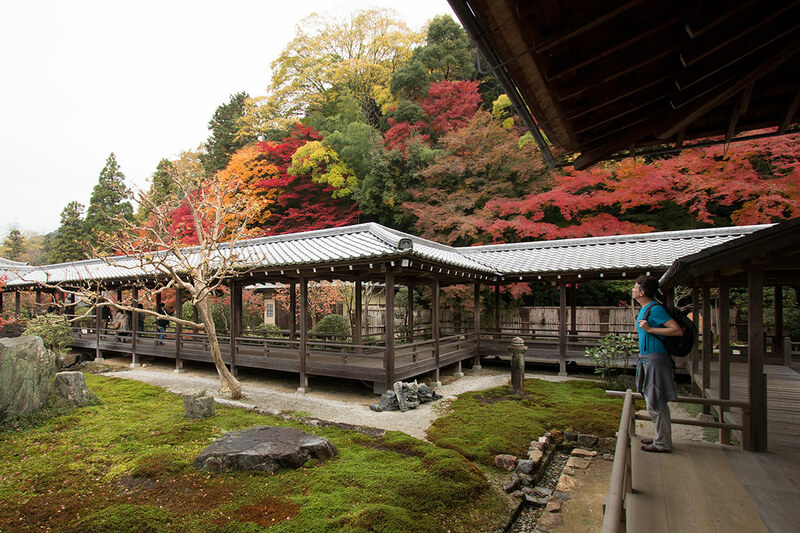 Eikando Temple (entry fee) – Eikando was our favorite Kyoto autumn leaves location. 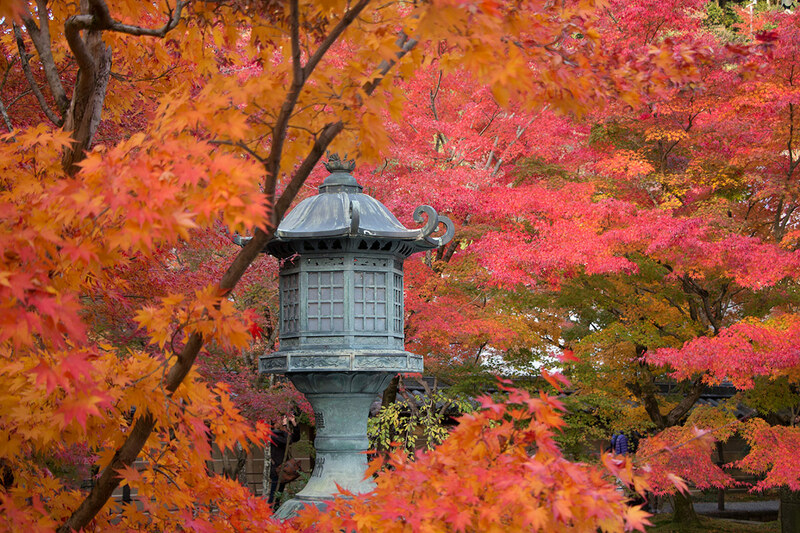 In full color, the temple’s maples are a site to behold. It also has some gorgeous ginkgos. Don’t miss the opportunity to sip a hot cup of their amazing traditional sweet sake-like drink. Yum! Arashiyama Hills (free) – This is a Kyoto must-see. It’s one of the best places in the city to see the wild maples changing. There are many trails leading into the surrounding mountains and the walk to Senko-ji Temple offers great riverside views. Nara Park (park free, entry fee for specific temples) – The park offers spectacular autumn leaves with a large number of massive ginkgos. 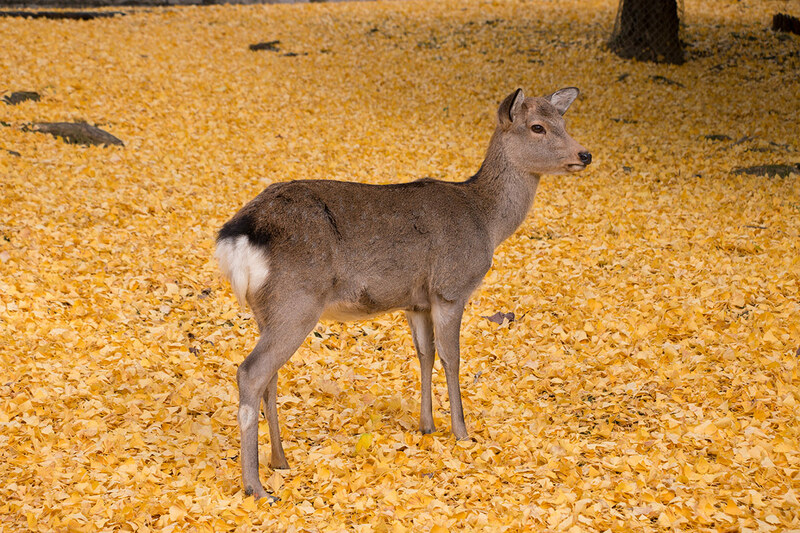 The sight of the famous Nara deer wandering over a carpet of yellow is pretty awesome. 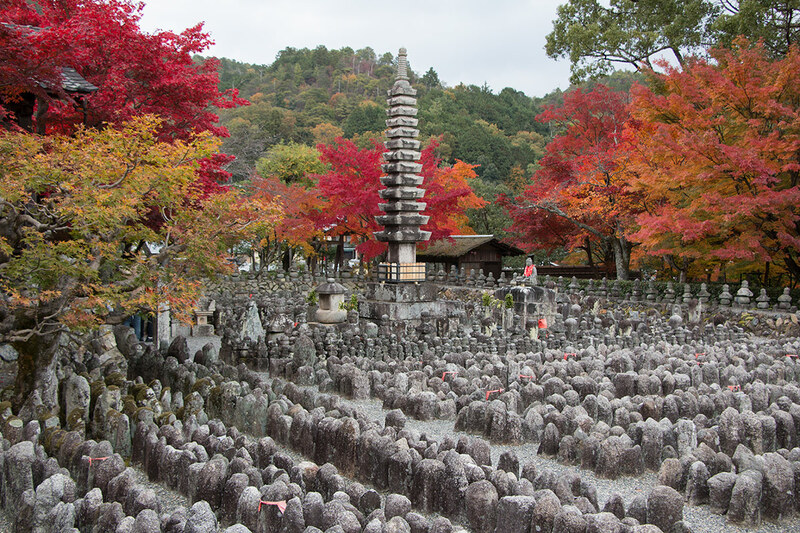 Shinnyodo Temple (free, but entry fee for Zen stone garden) – This off-the-beaten-track location was one of our favorite fall foliage sites and the lack of entry fee to see the trees means you can check back over and over to see the autumn leaves changing. Adashino Nenbutsu-ji Temple (entry fee) – There are many well-known (and crowded) fall foliage temples in Arashiyama, but this off-the-beaten-track temple was by far our favorite. Canopies of multicolored maples backing the wild stone memorial markers were a sight to behold. 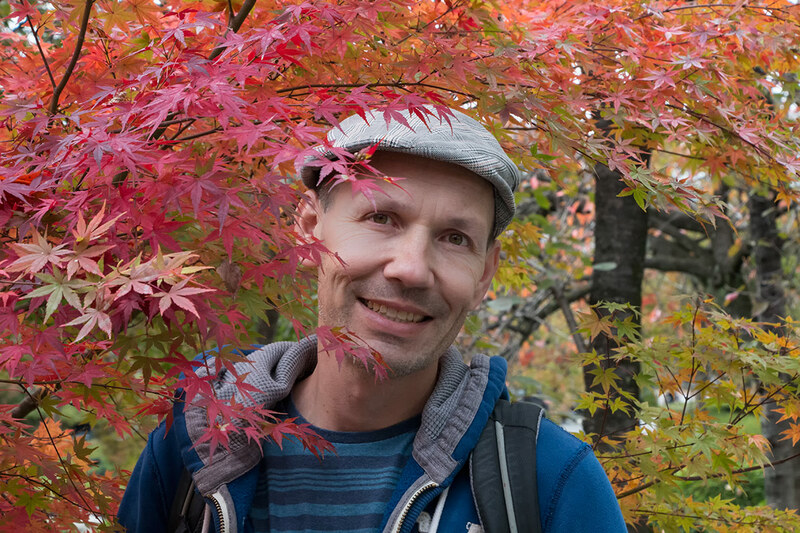 The Philosopher’s Path (free) – Timed right, this walk can be quite beautiful with colorful Kyoto autumn leaves backing the canal and tons of opportunities to head out into the side streets for more fall foliage discoveries. 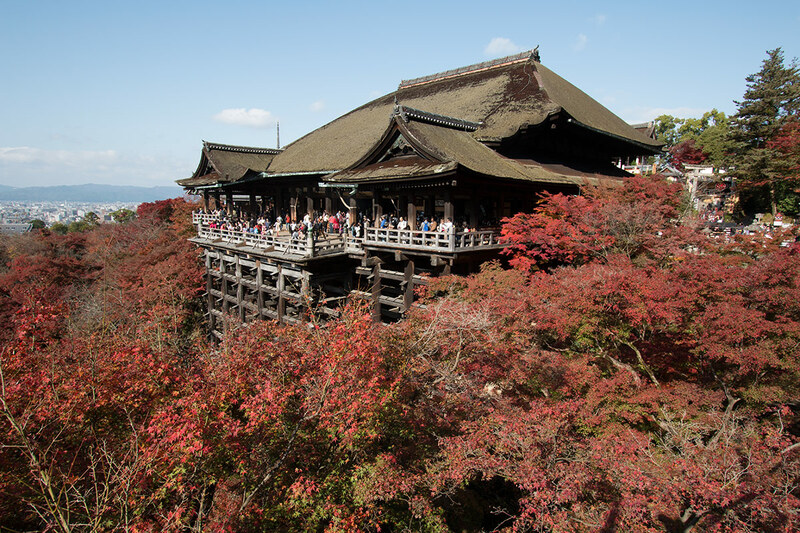 Kiyomizu-dera Temple (entry fee) – The balcony surrounded by fire-red trees is on half the postcards in Kyoto. We timed our visit for the red peak, but if we had it to do over, we would have made multiple visits to this temple during the change of the autumn leaves. Nanzen-ji Temple (entry fee for gardens) – Beautiful fire-red maples and lovely ginkgos in the free portion of the temple, but the real highlight was the zig-zag walkway in the Hojo Garden. 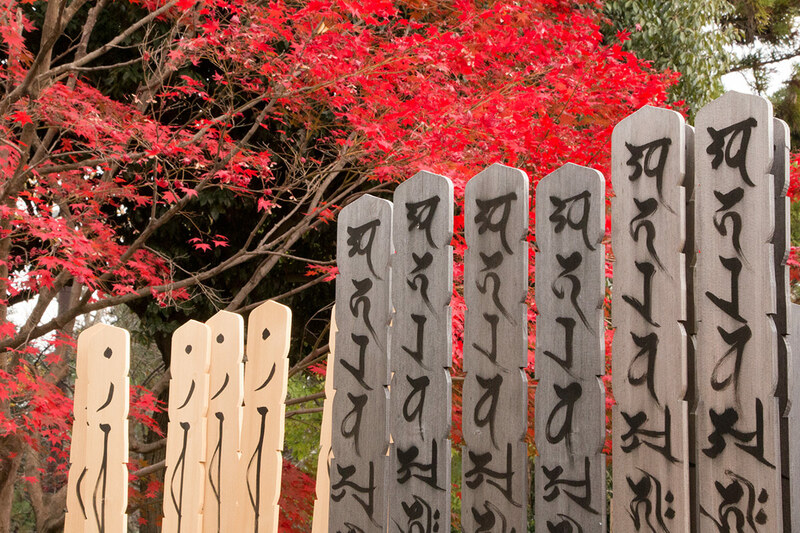 Todai-ji (entry fee) – This is not traditionally on most Kyoto autumn leaves lists, but we thought it really should be. The trees backing the small pond create a gorgeous wall of red, and Japan’s tallest pagoda makes for some great shots. Daigo-ji Temple (entry fee) – This temple is a bit off the track but it is well-known by photographers for its lakeside pavilion. Kinkaku-ji Temple (entry fee) – The famous Golden Temple is also not on most Kyoto autumn leaves lists, but we actually thought it was quite beautiful and there is a great photo opportunity with the sparkling golden monument ringed in autumn leaves. Japan Guide’s autumn color report – Great list of fall foliage sites with detailed info on timing. We agree with most of their evaluations and rankings. This larger site is also very useful in planning any visit to Japan. All About Japan’s “The 15 Top Fall Color Spots in Kyoto” – We don’t agree with the ranking, but this is a great list of individual sites. When to Go – The best time to visit Kyoto also coincides with the best time to visit Japan in general. 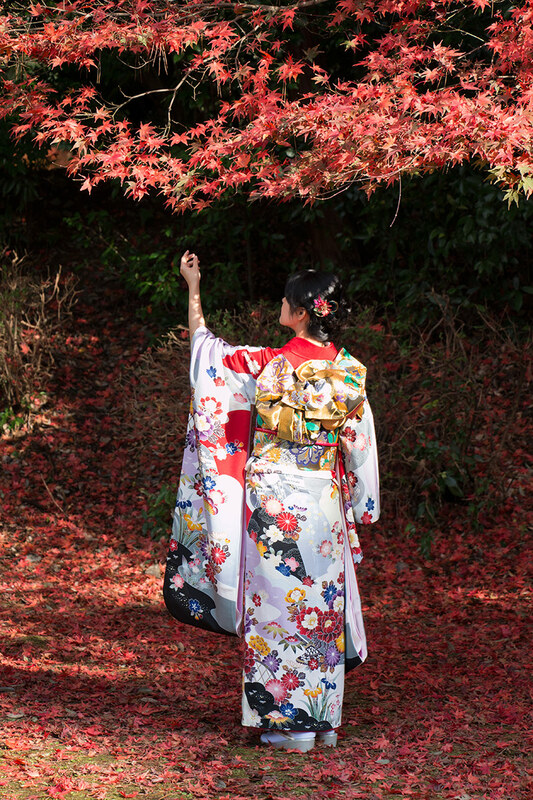 Spring (from March to May) and autumn (from September into December) are the preferred seasons for Japan’s famous cherry blossoms and autumn leaves. Outside of these seasons, it can be quite cold in winter and very humid and rainy in summer. 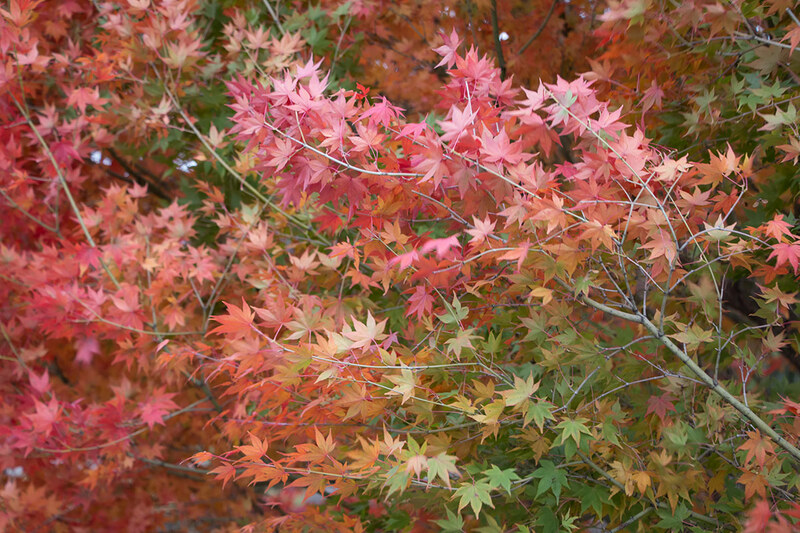 As mentioned above, Kyoto in November is the perfect time for colorful autumn leaves. If you only have a few days, it’s best to aim for mid to late November. Accommodation – During the Kyoto autumn leaf and cherry blossom season, accommodation can be booked out far in advance. Make sure to book early. We recommend searching for great Kyoto deals at HotelsCombined.com, a site which finds the best deals for you across numerous top hotel booking sites, including booking.com and agoda. If Kyoto hotels are hard to come by, you can also stay in nearby Osaka, which has great train connections to Kyoto. If you stay in Kyoto or Osaka for an extended period of time, we recommend booking an apartment through Airbnb. We stayed for a whole month in Kyoto, and our small apartment with kitchen, bathroom and washing machine (!) was a lot more convenient than a small hotel room would have been. If you haven’t used Airbnb before and you click through this link here, you get a credit toward your first stay. The amount varies, but it’s usually between $30 and $40. Not too shabby. Where to Stay in Kyoto – For convenience, the best places to stay in Kyoto are the neighborhoods of Kyoto Station as well as Northern and Southern Higashiyama east of the Kamo River. The Kyoto Station area is a great transportation hub and boasts plenty of hotels and restaurants. If you like it a bit more traditional, stay in Higashiyama. We stayed right in between Northern and Southern Higashiyama near the Sanjo Station and went everywhere on foot. From Sanjo, it’s a great walk to Gion, Kyoto’s famous geisha district. Tours – The area where most Kyoto tourist spots are located is relatively small, compact and quite easy to navigate. 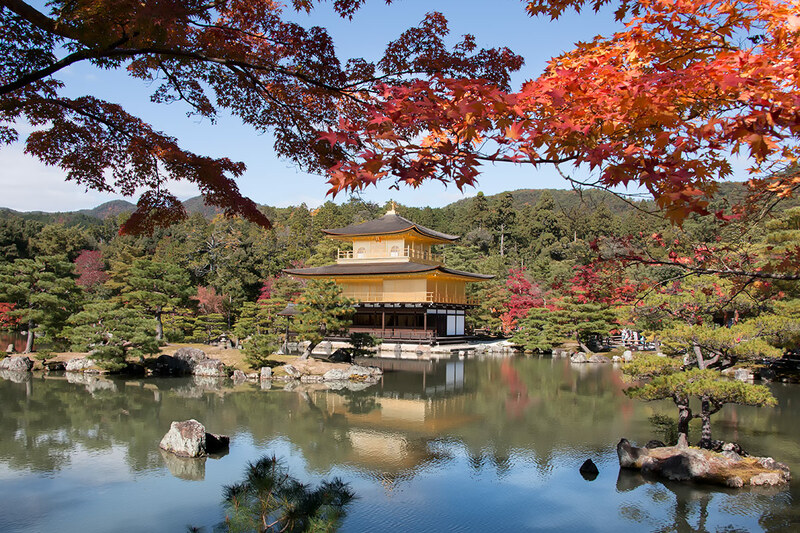 If you are visiting for the colorful Kyoto autumn leaves, you can put together your own Kyoto itinerary by following our guide. Alternatively, you can take a tour if communication and cultural differences seem a bit overwhelming. Moreover, Kyoto sightseeing as part of a group can be a lot more fun. Viator is a fantastic choice and offers several tours for autumn leaf aficionados. If you are staying in Kyoto, you might be interested in the Arashiyama and Sagano Walking Tour. If you are staying in Osaka, check out Viator’s Kyoto day trips including the Three Scenic Temples in Kyoto and the Sagano Romantic Train tours. Both start from Osaka. 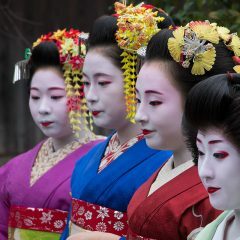 Feel free to browse through all of Viator’s Kyoto tours if you are looking for a special maiko performance, a Kaiseki lunch, a rickshaw tour or a dinner with a geisha. Guidebooks – We often travel with a Lonely Planet. It’s an old habit we developed when we first started traveling through Africa in the early ’90s. During our three months in Japan, we used the Lonely Planet Japan and were quite happy with it. It’s great for historical and cultural information, maps, walking tours, highlights, and itineraries. If you plan on visiting only Kyoto, there’s also a more detailed Lonely Planet Kyoto . Both can be conveniently purchased on Amazon. Some amazing photos there. Even for you guys! And I don’t know if you read it or not, but we didn’t touch the color on any of the photos. That’s all real. Have you been to Japan, Corno? Your photos bring back some good memories of my trip to Kyoto last October. The leaves were just starting to change colors when I was there. But even so, the city and its ancient temples and castle were so mesmerizing. 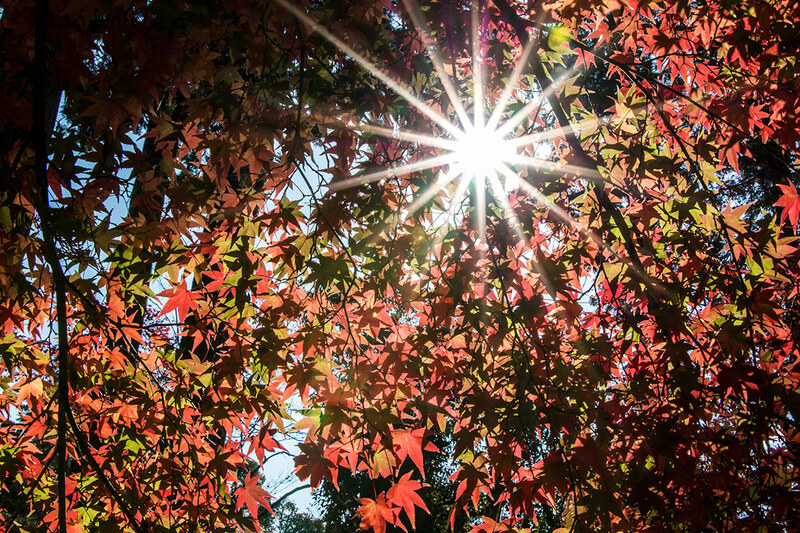 Beautiful, beautiful photos of the autumn foliage, guys! The striking beauty of Kyoto in the fall is really something! I cannot wait to travel there, thank you for the temple and shrine list! It’s an amazing place, Therie. 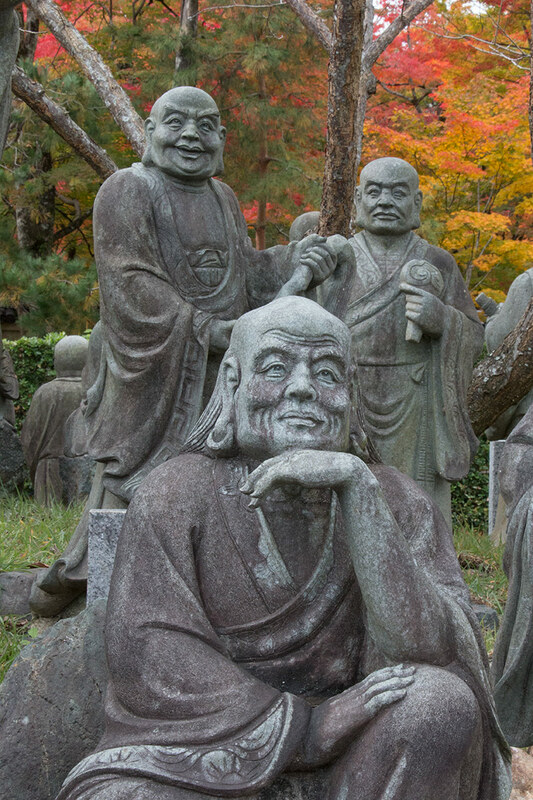 Most of the information we had seen on Kyoto temples was about the well-trodden temple path. We created this list to include some of the lesser-known but equally amazing and less busy temples and shrines in Kyoto. Hi those photos are really lovely. I understand that Eikando is very crowded during that time. What time did you go? You managed to capture the scenery with minimal crowd. If you could only go to one, will you pick Eikando over Tofukuji? We got a little annoyed by Tofuku-ji because they charge separate entry fees for several sub-sections. They also enforced a photo ban on the Tsutenkyo Bridge and the Gaunkyo Bridge in 2016 to minimize congestion. There may still be some limitations in place this year. Eikando to us was just amazing. We went there around noon and spent 5 hours (!) there – that’s how we got some photos without crowds. You just have to wait long enough for that perfect shot. Believe me, all the temples are incredibly busy during autumn leaves season, so you just have to know that and be patient. Hope, you’ll have a chance to see more than one temple; they are all unique in their own way.